The Australian National Yurt Project, initiated by me in 1997 with the assistance of The Australian Forum for Textile Arts (﻿TAFTA﻿), was a highly successful Australia-wide Community Arts Project from 1998 to 2016. Now retired from active life, it involved a full-scale Mongolian style Yurt, built with the participation of some 150 people in different parts of Australia. 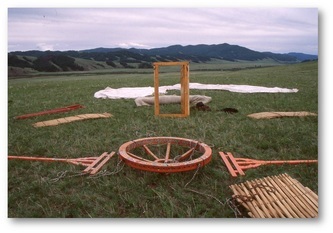 The Yurt Project came to fruition after I made a wish and followed where it led me. 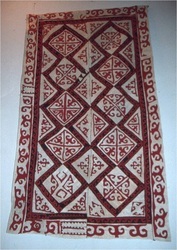 In pursuit of felt I traveled on a 4-month Felt Research (and teaching) tour to Mongolia, Russia, the UK, and mainland Europe. 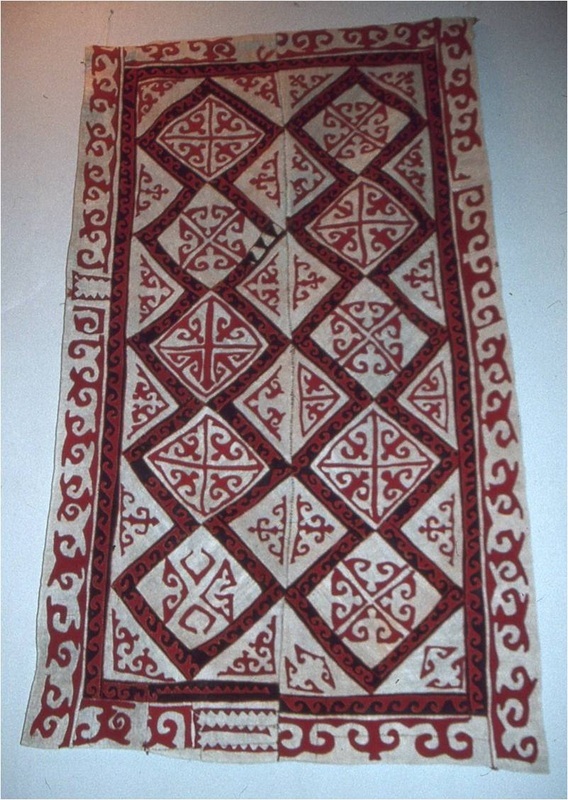 I visited Ethnographic Museums in St. Petersburg, Russia and Denmark and studied first-hand the historic collections of felts held in these locations, resulting from archaeological expeditions in the early 1900s to Central Asia and Mongolia. Seeing these felts 'up close' proved the perfect start for my journey of a lifetime. In Mongolia, I observed and participated in the traditional process of felt-making. I stayed in Yurts, and learned firsthand about their structure, purpose and significance in the relatively harsh Central Asian landscape and climate. 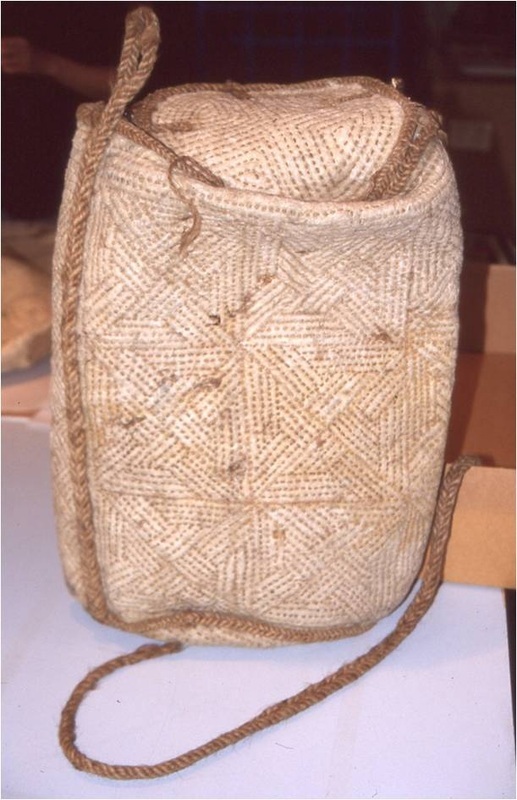 I also observed other traditional craft skills which form part of nomadic life, such as leather work and boot making, hand-twisting rope and yarn, and traditional felt stitching. It was a magic time in a magic location. 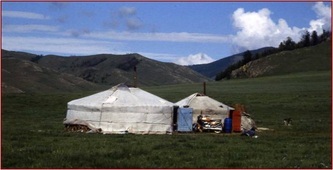 I reluctantly left Mongolia, and returned to Australia with a wealth of information, dreams overflowing with Yurts, and the wish to share my experiences with as many people as possible. 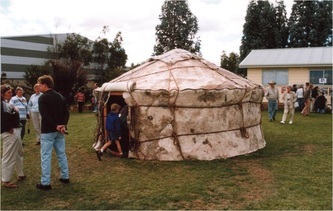 The Australian National Yurt Project was born. 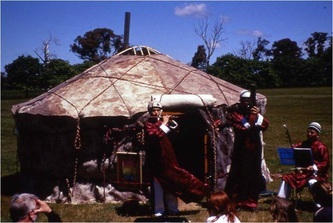 The Yurt was built between November 1997 and April 1998. 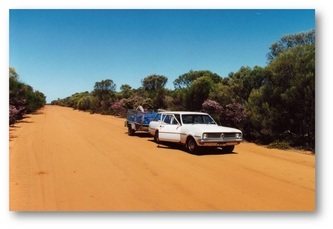 It involved some 150 people right across Australia. I travelled some 12.000 kilometres (7.500 miles) to 4 different states where groups of feltmakers gathered to make large pieces of felt using traditional techniques still used by Mongolia’s nomadic populations today. 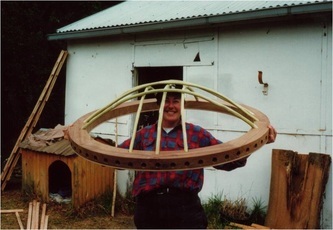 These pieces were later sewn together to form the two semi-circular roof panels of the Yurt. As an overarching component, the roof symbolises the connections of feltmakers across the miles. It is furthermore symbolic that the fleeces used to make the felts were donated by breeders of so-called Black & Coloured sheep in every state where the roof panels were made. 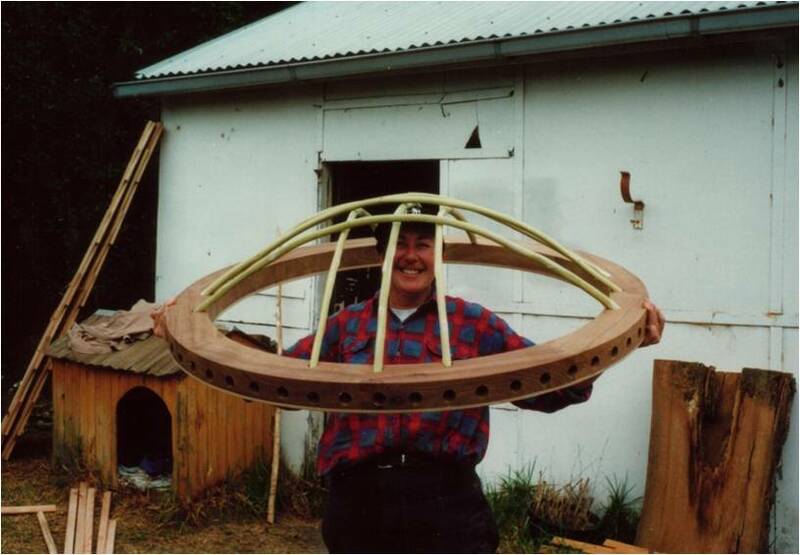 Based on my documentation and following authentic Mongolian design and construction methods, wood-worker Kerry Bryan generously donated her time and energy to the project and constructed the major part of the wooden frame. Timbers used include plantation oregon, reclaimed elm, recycled pine and oregon and sycamore. 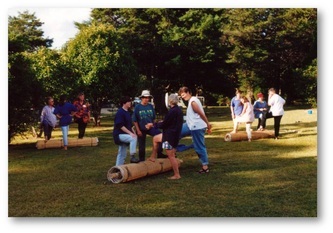 The finale of the Yurt building took place in April 1998 at TAFTA’s FORUM in Mittagong, N.S.W. 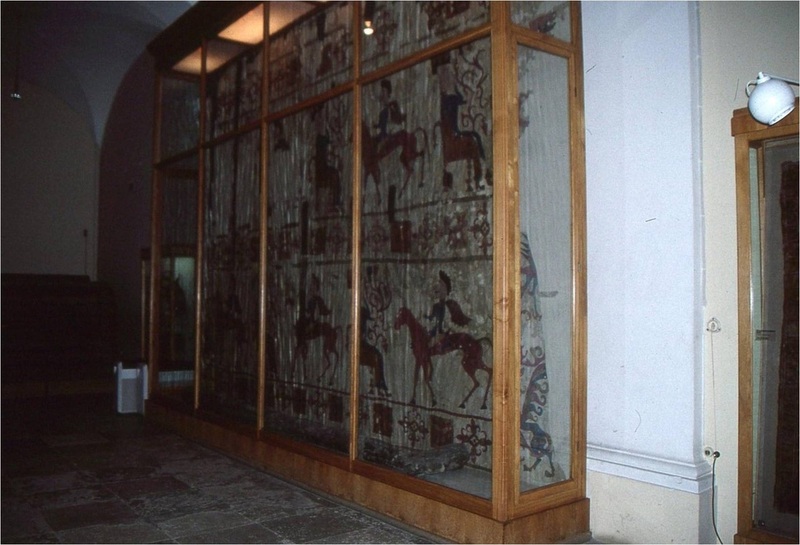 There, fifteen felt-makers gathered to finish the frame, and make the entire wall felts needed, some 21 meters (70 feet or 23 yards) in all! 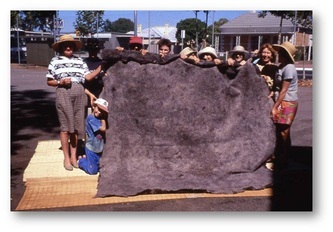 They were helped in the felting process by a horse. 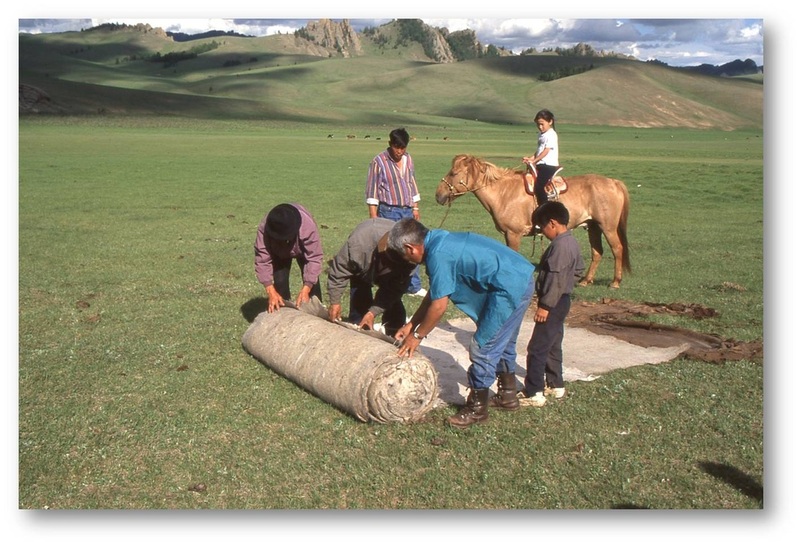 This is common practice when making felt in Mongolia but it was the first time this had happened in Australia on such a scale. On the final night of the FORUM, we slept in the newly finished Yurt. 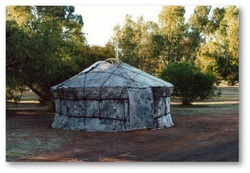 Since its completion in 1998, the Yurt Project has conquered logistical challenges and enormous distances, and has traveled the vast and varied Australian continent, sometimes in true nomadic style. With its coordinators (aka Yurt ‘Mothers’), the Yurt visited schools, community festivals and textile-related conferences such as TAFTA’s FORUMS. 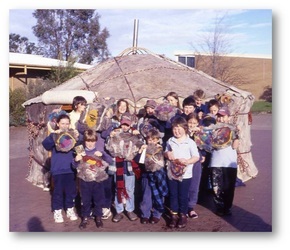 The Yurt formed ‘a meeting place at a meeting’ of people, creativity and ideas. 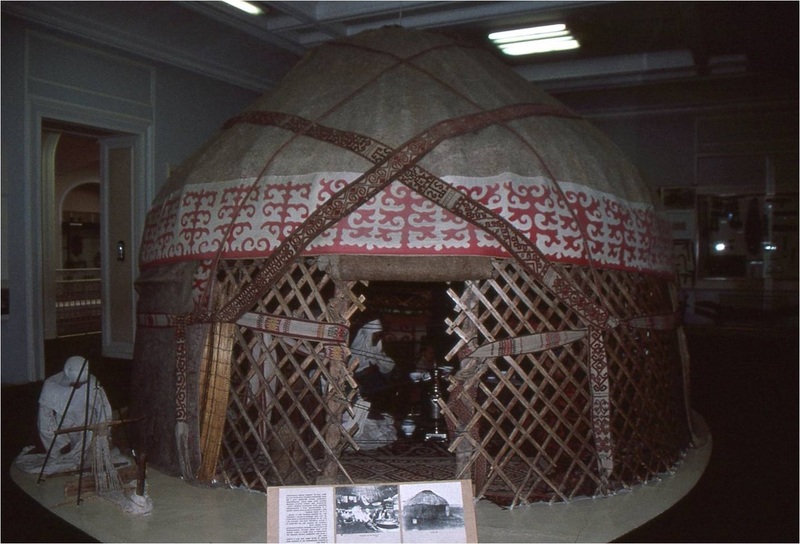 As an interactive display, the Yurt offered people of all ages a close-up encounter and glimpse of living in a traditional Yurt and all that this might entail. 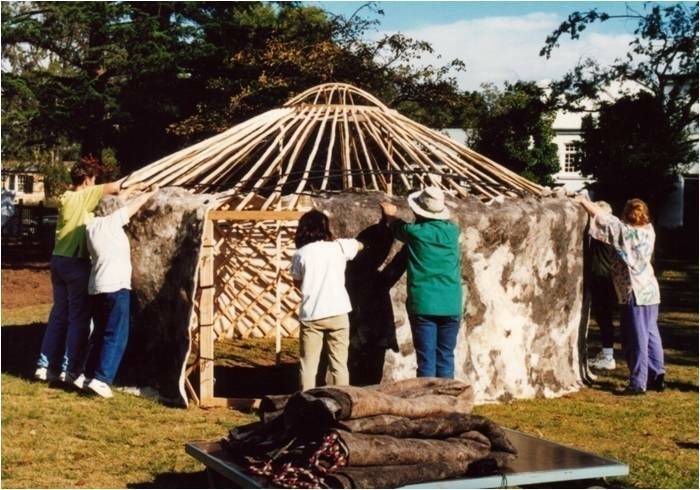 In its various forms, the Yurt project also addressed the theme of Shelter - the ways in which we might choose to live and what is truly necessary to survive; socially, physically, emotionally or otherwise. 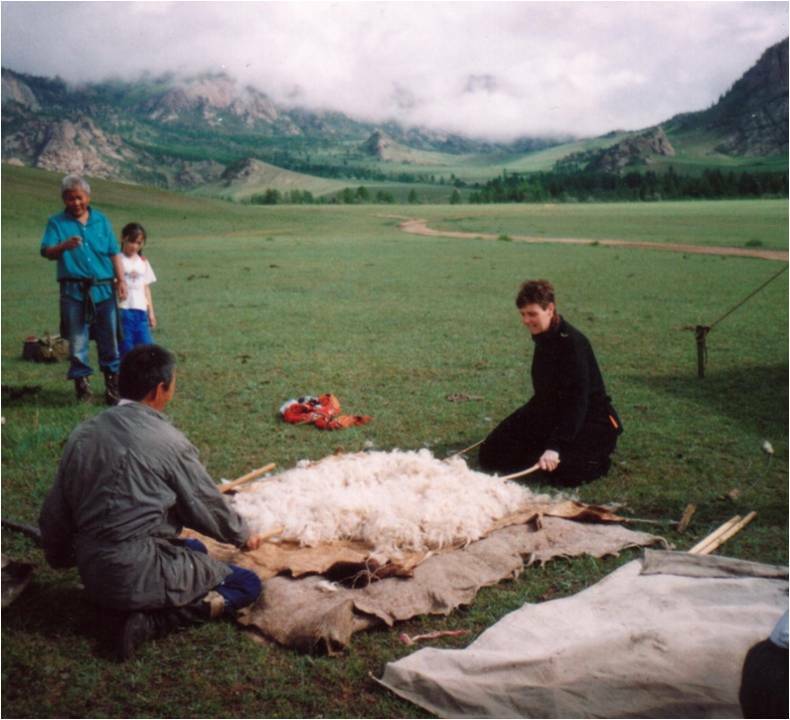 The essay about my Felt Research Tour and the Yurt Project was first published in Textile Fibre Forum, vol.17, issue 3, no. 53, 1998. 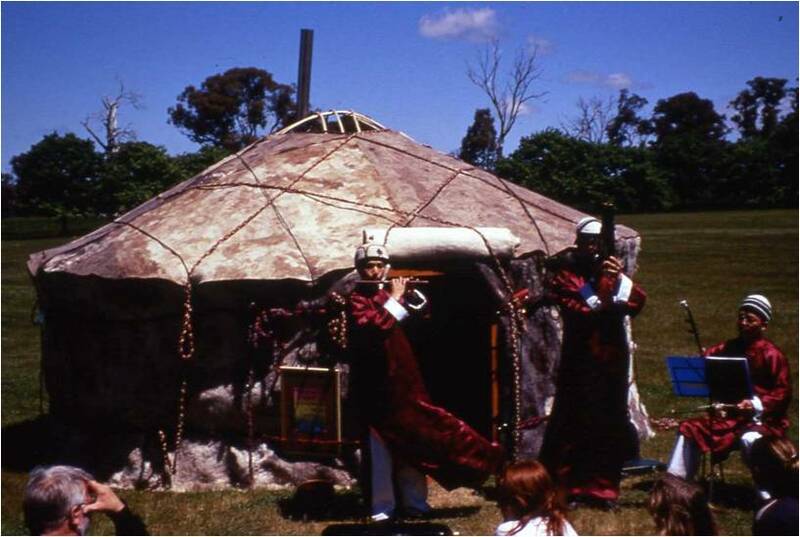 An informative, entertaining and visually rich presentation of Martien's travels and the Yurt Project. See here for details.